Many craft breweries start out small, then slowly expand as they find some success and the demand for their beer grows. A few breweries, on the other hand, start out small and prefer to stay small by choice. One such brewery is Foggy Noggin Brewing Company in Bothell. Since first opening their doors to the public back in 2010, Foggy Noggin has been brewing on a tiny 1/2 barrel system. 1 barrel is approximately 31 gallons, so brewing on a 1/2 barrel system means that Foggy Noggin produces just 15.5 gallons of beer per batch. That’s about enough to fill just one full size keg, though most of their beer finds it’s way into 1/6 barrel (5 gallon) or 1/4 barrel (7.5 gallon) kegs. Now Foggy Noggin is preparing to celebrate their 8th Anniversary, with a 3-day-long celebration from March 23rd to 25th and the release of their special 8th Anniversary Ale. Hard to believe it, but Foggy Noggin Brewing turns 8 years old this month. In many ways it seems like yesterday, but it has been 1,600 batches ago. 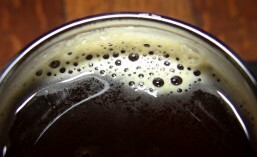 Annually, we release our vintage Anniversary Ale (English Old Ale) 6.8% ABV – 55 IBU. Anniversaries should be celebrated with a rich, full-bodied ale with lots of flavor and a hoppy balance to make a memorable experience. This wonderful Old Ale is ready to drink now, but will develop a more complex flavor profile with 3-5 years of proper cellaring. Because 8 years is such a huge milestone, we will open our tasting room Friday, Saturday and Sunday (March 23rd – 25th) to meet the thirsty needs of Washington beer lovers. Our annual vertical tasting event of all past years of Anniversary Ale, sold out in record time. This is the first chance to taste the current vintage and compare to years past, an excellent way to gauge the aging of years past and determine how many bottles/cases of 2018 to purchase. Each of the three days will have our 2018 Anniversary Ale on tap and 22 ounce bottles will be for sale, as long as they last. Friday – March 23rd (3-7pm) – Join us as we celebrate our 8th Anniversary this weekend. We release our 2018 Anniversary Ale (English Old Ale) 6.8% ABV – 55 IBU on tap and limited 22 ounce bottles ($5/bottle). We will have some vintage years of Anniversary Ale on tap, until the kegs are blown. FRIDAY SPECIAL EVENT – We will tap a Cask of 2018 Anniversary Ale at 3pm, this is the first time this beer has ever been cask conditioned. We will pour this Cask all weekend, until it runs out. Saturday – March 24th (12-5pm) – Join us as we celebrate our 8th Anniversary this weekend. We release our 2018 Anniversary Ale (English Old Ale) 6.8% ABV – 55 IBU on tap and limited 22 ounce bottles ($5/bottle). We will have some vintage years of Anniversary Ale on tap, until the kegs are blown. SATURDAY SPECIAL EVENT – Enjoy our Fn beers and have a piece of Anniversary Cake, while it lasts. Sunday – March 25th (12-5pm) – Join us as we celebrate our 8th Anniversary this weekend. We release our 2018 Anniversary Ale (English Old Ale) 6.8% ABV – 55 IBU on tap and limited 22 ounce bottles ($5/bottle). We will have some vintage years of Anniversary Ale on tap, until the kegs are blown. SUNDAY SPECIAL EVENT – Every Fn beer you order will give you a ticket for drawings hourly for cool Fn merchandise. I believe Foggy Noggin is still the smallest production brewery in Washington and it’s clear that owner/head brewer, Jim Jamison loves his work. You have to love what you do to keep brewing such small batches for so long. Why not come up to Bothell the weekend of the 23rd and help Foggy Noggin celebrate 8 amazing years. This entry was posted in Aged, Ale, Anniversary, Annual, Award Winning, Beer, Beer Ingredients, Beer Labels, Beer Release, Best Of, Bothell, Bottling, Branding, Brewery Equipment, Brewing, Cask, Craft Brewery, Distribution, English Style, Events, Limited Edition, Local, New Release, On Tap, Seattle, Taproom, Taps, Tasting, Washington, Washington Beer, Welcome, Winter and tagged 2018, Anniversary, beer, Beer Release, Bothell, English Style, Foggy Noggin Brewing, New Release, seattle, Washington. Bookmark the permalink.